One of Northern California’s legendary teachers, as well as a dear friend and mentor to me, Fred Earle penned the following 5 keys – that he expected his players to answer with a resounding yes, each and every day at the end of practice or a game. And over the years at our club, I have seen that these 5 keys, when observed, are most often associated with players who improve more quickly than others. Unfortunately, as often as not, players who get stuck along the way seem to struggle with these 5 keys. Take them to heart – perhaps even copy them print them and post them on your refrigerator, or even your racquet bag!! One of the most difficult things for tennis players to acquire is confidence in themselves and their game. It’s difficult because confidence is something that can’t be taught. You have to risk and take chances in order to gain a better feeling about your game. Confidence is something that is built from success. So the key is how to define success. If your definition stems only from your wins when you play, your successes may be few and far between. I try to have all my players learn a simple formula which will not only help them with their success and confidence in tennis, but in everything they do, from school to their jobs, and their relationships with their family and other people. I first heard this formula from Jim Loehr, a noted psychologist from Denver, CO., about five years ago and I have used it ever since. If you can answer “yes” to each of the following five statements at the end of a match, lesson, or practice session, you have been successful and your confidence will grow. I put out 100 per cent effort today. I gave it all I had. I maintained and sustained a positive mental attitude. It’s been said over and over again, that success in every endeavor is based on attitude rather than technical expertise. A positive mental attitude is one key ingredient for becoming a success and building confidence. Feeling good about yourself and your progress is based on a positive attitude. Smile and enjoy what you are doing. Avoid frustration as it builds negative emotion and feelings. Remember, your thoughts control your feelings, so keep your thoughts positive. There is a tendency in all of us to want instant skill. (Un)Fortunately, anything that’s good in life takes time and effort to learn. Be patient; avoid anger and negativism that occurs from being angry. Remember, easy does it. A little at a time. As you become a better player, improvement comes slower. Be patient. I allowed myself to make mistakes. I accept full responsibility for me today. What I did and did not do is a result of me and me alone. 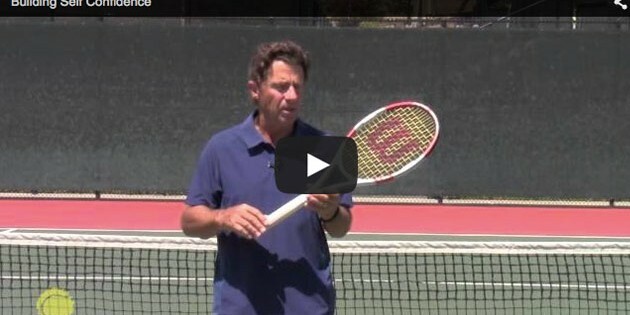 I was wondering if you had some advice about at what age should children start hitting from the baseline in tennis? My 7 year old is now hitting better from the service line but I am trying to figure out when and how to progress. Great one, Jim! Thanks for sharing. I am sure the 5 keys that you listed above would help us in every aspect of our lives, but I think they are especially important in tennis and other performance arts. Tennis and performance arts are motor skills, it is not like reading and memorizing a book. I personally know people who are scholars and did really well in the academic fields, but they do poorly in tennis and have a hard time to improve. And how could it be ? I keep asking myself. But I found a common thread that put them into a group – they have no patience ! It might have something to do with their ego…because they did so well in the academic fields and they translate that into “everything should be easy” because they are so smart. But the truth is – tennis is not an easy sport, for the most of us at least ( sorry guys, I have to tell the truth). Take the serve, for example, there are so many components that comes into play that we have to put them into a perfect sequence to get a good outcome. We have this well – educated gentleman in our club who changes his racket so often ( sometimes, within 15 minutes ? It is a true story! ) 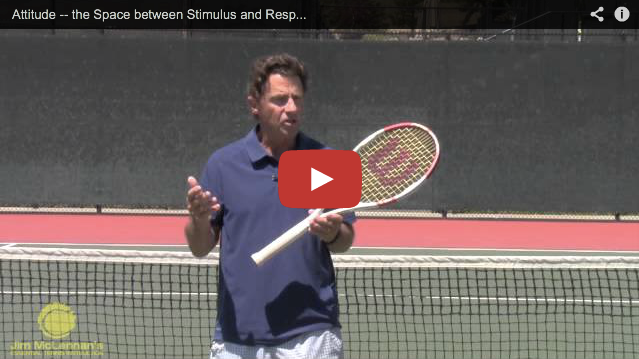 that it interrupst our game – believing the racket is totally responsible for his strokes. And I am also a student of music – learning the jazz guitar. And I have come to learn that one has to go step by step, yes, most of the time slowly to get any improvement at all. Tennis is no different. If you don’t enjoy the process and the practice, guaranteed you will get frustrated. Unless you are as talented as John Mc Enroe. This latest email on the 5 keys was excellent. I have been a teaching professional for the past 11 years and find your instructional videos to be, in a word, superior. Barry – this is a much appreciated note – thank you! 1 Yes I always give 110% mentally and physically I must feel the pain and have plenty of endurance.-I have the Connors attitude -Mr Tennis is my name with full passion. 2 If I loose 6-0 6-0 I still stay positive because next time I may loose 6-1 6-2 but gradually I progress and beat him. I had a really great tennis morning today. I have gotten an idea into my head very clearly that I am not “consistent” in an absolute sense, but that early on in the warmup and in a match, I have to establish (fresh, every time) consistent play with every opponent and situation. Of course, in doubles this is a bit more complex as supposedly “our goals are shared” by my partner – sort of a very dicey issue for soc/rec doubles. That until I establish consistent play, it is a bit unreliable to attempt to encourage errors from my opponents, take advantage of advertisements, and run plays. Of course, if I played that person before, it can be a quicker process. This was fun to watch! Thank you! Fabulous. I am passing this on to my employees, most of who are 18-25 year old males. When you build your confidence you build it on evidence. Thank you for the great video! This goes in my tennis bag. As always, thanks Jim, for your concise and insightful presentation of important and useful.